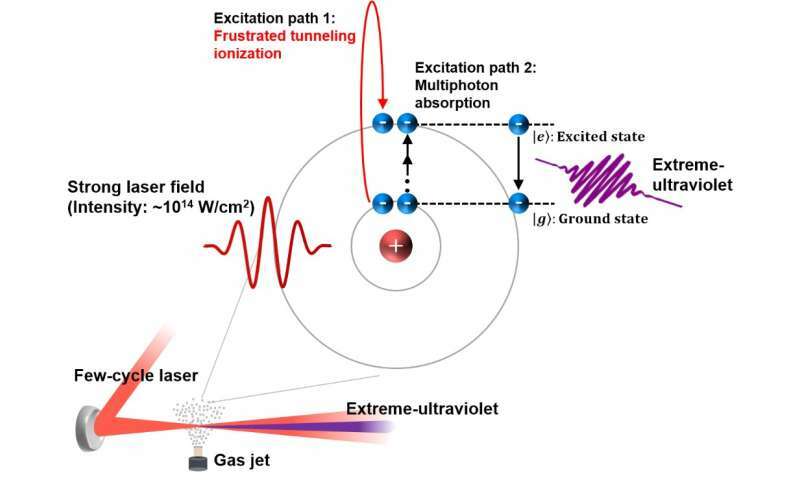 A team at the Center for Relativistic Laser Science, within the Institute for Basic Science (IBS), has found a completely new way to generate extreme-ultraviolet emissions; that is, light having a wavelength of 10 to 120 nanometers. Published in Nature Photonics, this method is expected to find applications in imaging with nanometer resolution, next-generation lithography for high precision circuit manufacturing, and ultrafast spectroscopy. Until recently, the motion of electrons at the atomic scale was inscrutable and inaccessible. 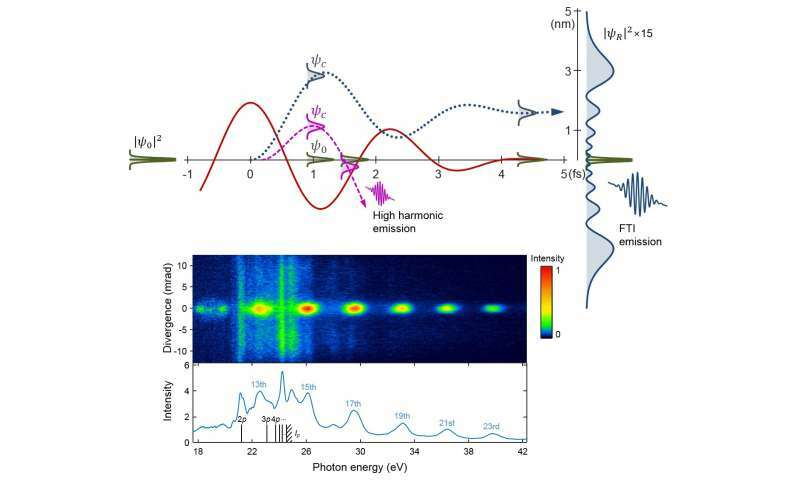 Lasers with ultrafast pulses have provided tools to monitor and control electrons with sub-atomic resolution and have allowed scientists to get familiar with real-time electron dynamics. One of the new possibilities is to use these laser pulses to generate customized emissions. Emissions are the outcome of meandering excited electrons. When a strong laser light shines on helium atoms, their electrons are free to temporarily escape from their parent atoms. As the laser is turned off, on the way back these meandering electrons could either recombine with their parents straight away or keep on "floating" nearby. The fast return of electrons is part of the high-harmonic generation, while the "floating" is called frustrated tunneling ionization (FTI). In both cases, the net result is the emission of light with a specific wavelength. In this study, IBS researchers have produced coherent extreme-ultraviolet radiation via FTI for the first time. IBS researchers were able to control the trajectory of electrons by manipulating characteristics of the laser pulse. In FTI, the electrons travel a much longer trajectory than in high harmonic generation, and thus are more sensitive to variations of the laser pulse. For example, the team was able to control the direction of the emitted radiation by playing with the wavefront rotation of the laser beam (using spatially chirped laser pulses). "We used IBS' state-of-the-art laser technology to control the movement of the meandering electrons. We could identify a completely new coherent extreme-ultraviolet emission that was generated. We understood the fundamental mechanism of the emission, but there are still many things to investigate, such as phase matching and divergence control issues. These issues should be solved to develop a strong extreme-ultraviolet light source. Also, it is an interesting scientific issue to see whether the emission is generated from molecules, as it could provide information on the molecular structure and dynamics," explains the group leader, KIM Kyung Taec.